As you may have noticed, the Central Valley is the next area I am trying to conquer in California. I’ve taken a couple trips up that way recently and hope to do more this summer. 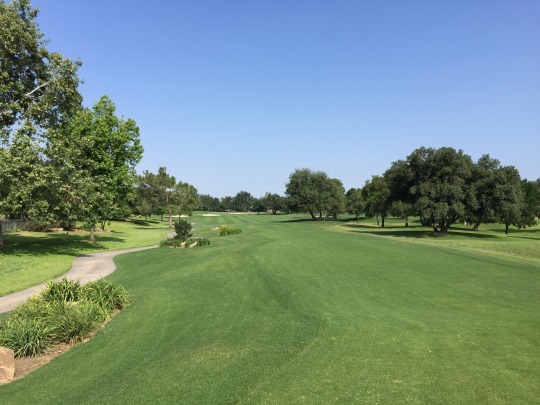 A handful of course collector friends and I were all signed up for an SCGA outing at Seven Oaks Country Club. 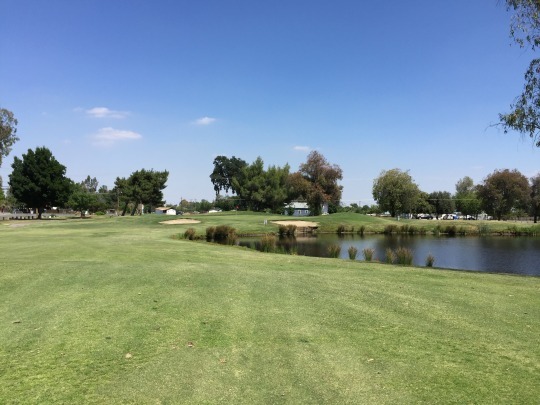 This was the SCGA’s first outing here and it’s not a club that opens up to many public groups, so there were a lot of like-minded golfers there to check it off their own lists. The outing was only $60, so that also made it enticing. When we pulled up to the Seven Oaks community, we saw some really big and beautiful houses. 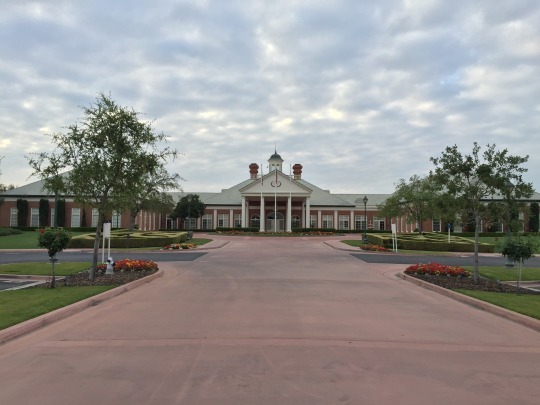 The big iron front gate leading to the club is cool, and the then the driveway leads you towards a stately clubhouse that is done in a colonial/southern style with bricks and columns. It reminded me of some of the cool clubhouses I’ve seen in the south and also a little of Sherwood Country Club. Either way, we knew from the moment we arrived that we would enjoy the experience here. It was an 8:00 shotgun start and our group began on the 18th hole, depending on how you look at the course. 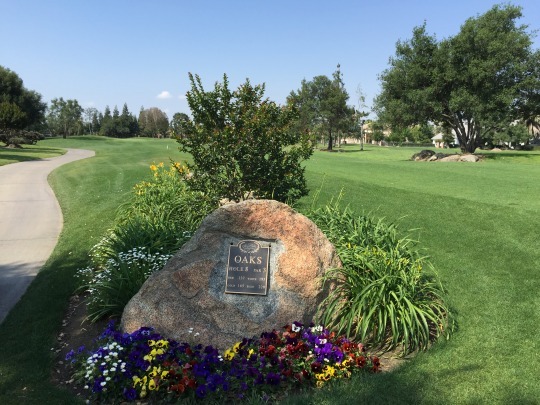 Seven Oaks is a 27-hole facility with three nines: Oaks, Lakes and Island. 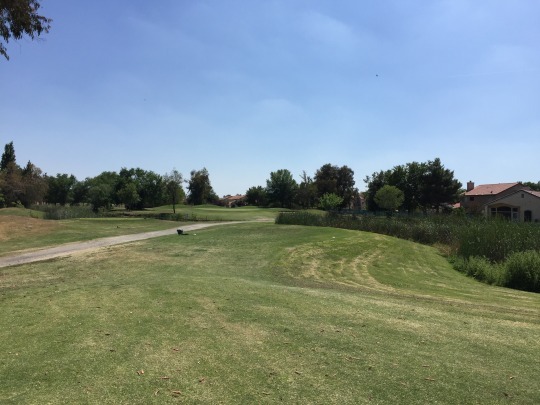 However, it started as a typical 18-hole course. After it expanded with nine more holes across the street at some point, they rerouted everything and split into the three nines they have today. 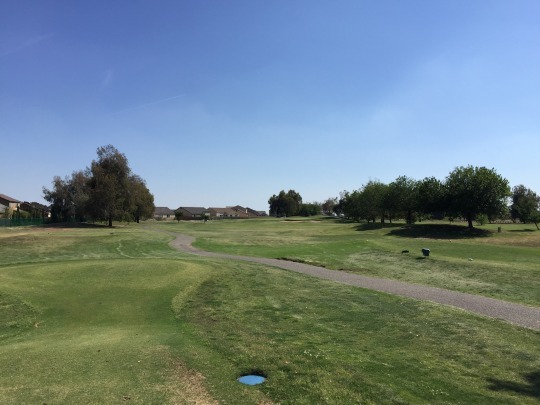 For this outing, they decided to have us play the “Original Course,” which is still rated and apparently used often for members. 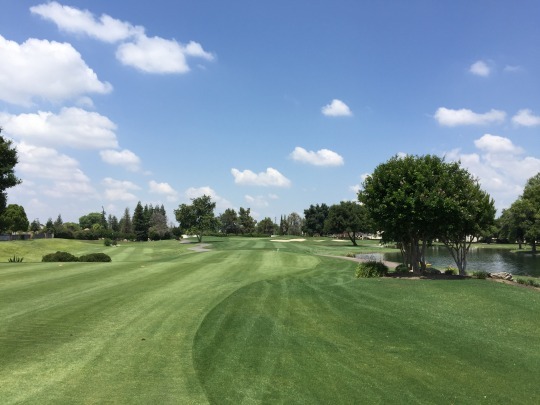 The Original Course consists of all nine holes from the Oaks Course, the first six holes of the Lakes course and then the final three holes of the Island Course. It was a bit confusing at first as this club has obviously hosted very few—if any—outside shotgun events. The carts were all set up in no particular order and nobody was really guiding players in the right direction. So we were not only playing a different set up than on the normal scorecard/map, but there wasn’t much organization to get things started. That was ultimately a minor hiccup. 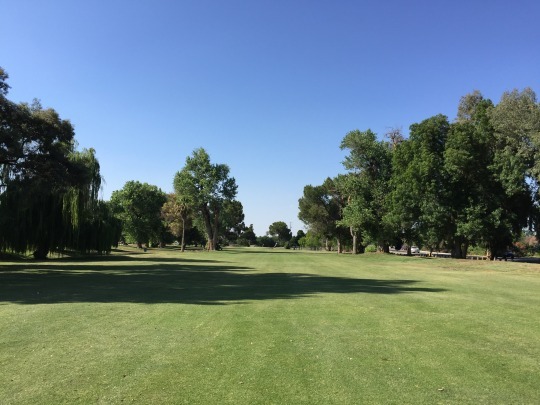 Once we were out on the course, any negativity was quickly lifted. The conditions here were extremely nice. The tee boxes, fairways and rough were all beautifully manicured. The water hazards all looked clean and pretty. There are nice little aesthetic touches around the tee boxes and hole signage. 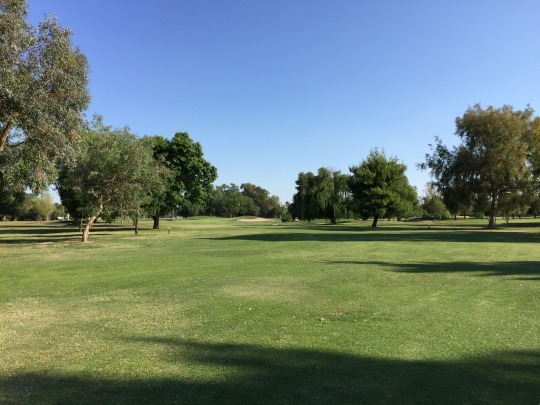 There are little environmental areas designated as kit fox habitats throughout the course (unfortunately no foxes sighted). It is just a pleasant and attractive presentation all the way around Seven Oaks. 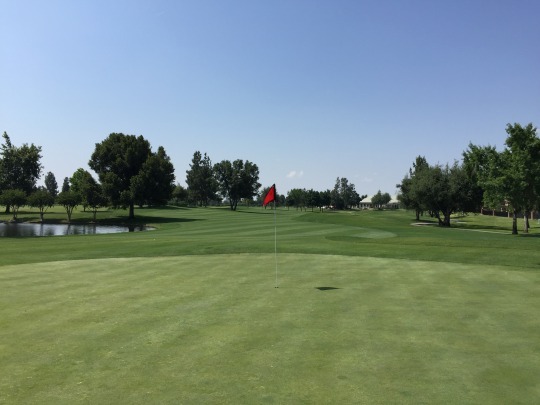 The conditions and aesthetics probably outshined the course itself, but it was still a very enjoyable layout. It was designed by noted architect, Robert Muir Graves. 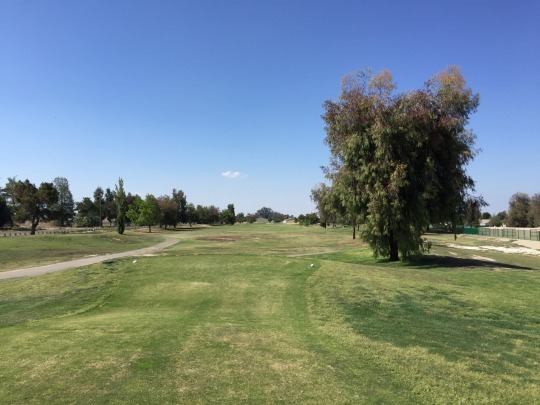 It’s kind of long like a lot of Central Valley courses are, but it did not seem to play too lengthy. We played the white tees at 6,578. Normally, that’s on the edge of the range I like to play for a casual round, but it felt right here. 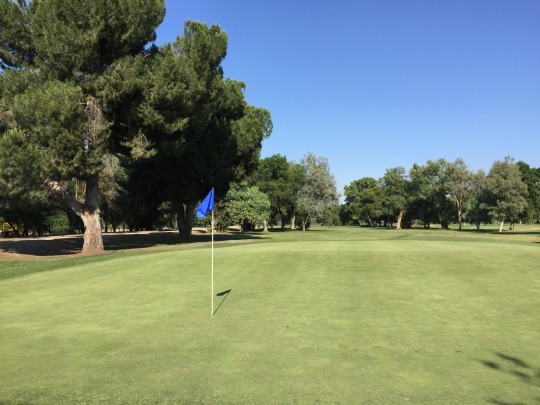 We were hoping to still play the additional nine holes while here, but they were closed off because they were doing some major maintenance that day. We did drive over there to take a peak. The rough was all browned out and you could tell it wasn’t set up to be played for a few weeks. 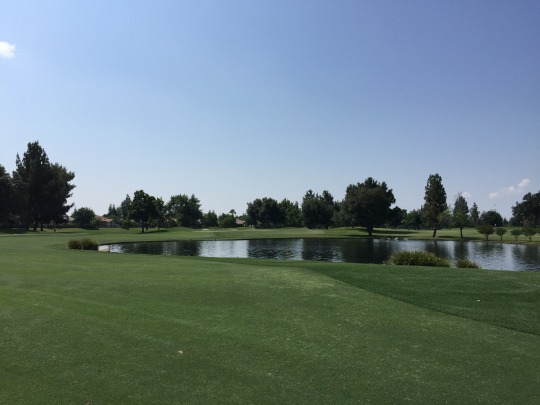 I thought the best part of the 18 holes we played was on the Lakes Course. 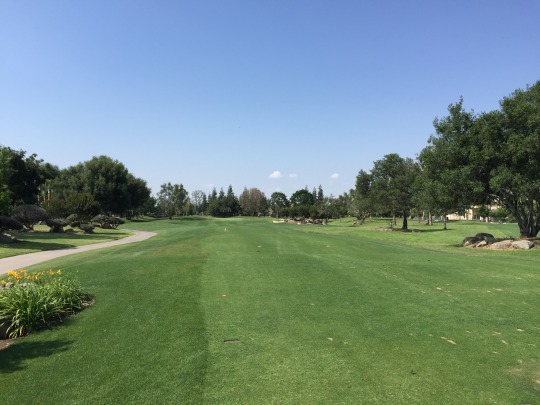 The 2nd hole (or the 11th for our routing) was easily the standout. 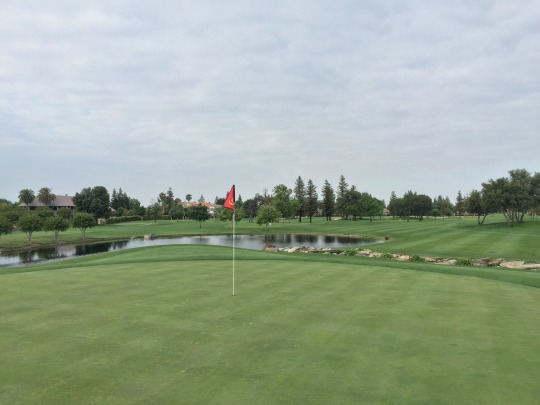 It’s big dogleg right par-4 that wraps around a lake. 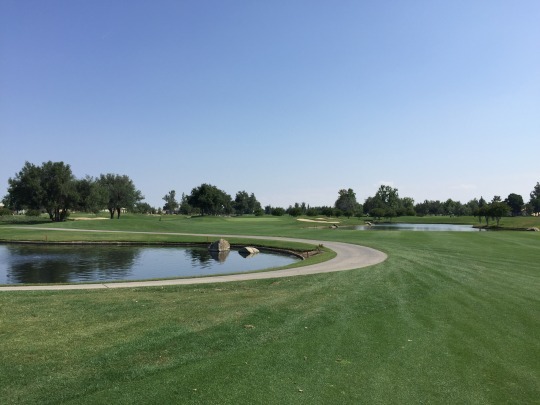 On the tee shot, you want to hug the water’s edge as much as you can but you have to be careful. And then the approach is directly over the water to the green. It’s a neat and demanding hole you just want to survive and then it’s followed by a short par-3 that allows you to really go pinseeking. 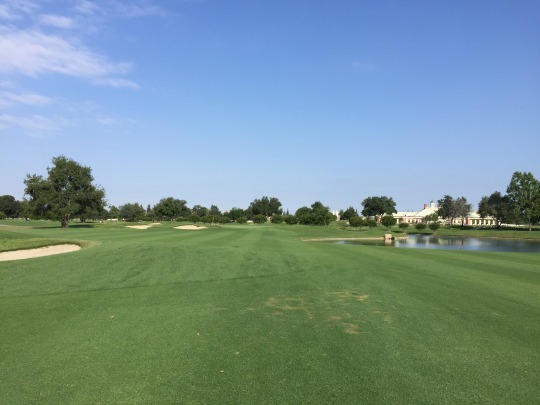 The best overall hole was the 9th on the Island Course (the 18th hole in our routing, but the first hole we played in the shotgun). You can tell this was designed to be a signature finisher. 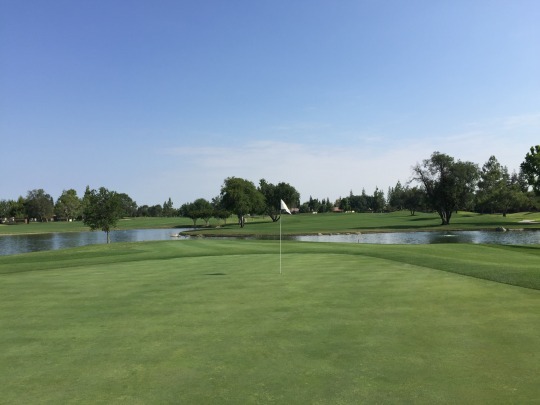 It has a water hazard to the right of the green and then a nice little rocky creek running across in front of the green to make for an intimidating yet scenic approach. 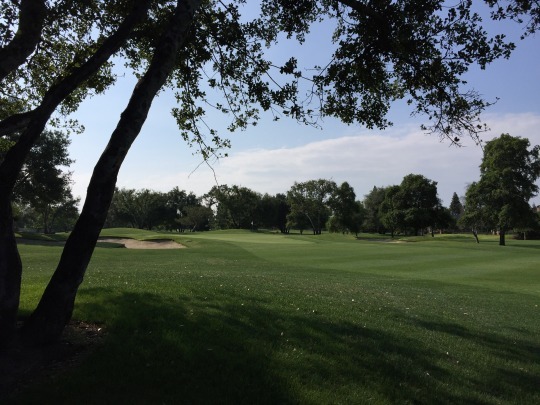 Ultimately, the course at Seven Oaks offers just enough challenge and diversity to keep things interesting, but overall it’s fairly forgiving and good scores can easily be had. The word we kept using all round was “pleasant” and I think that’s the best way to describe the experience here. It won’t bore you, it won’t beat you up, and the visual presentation is excellent. 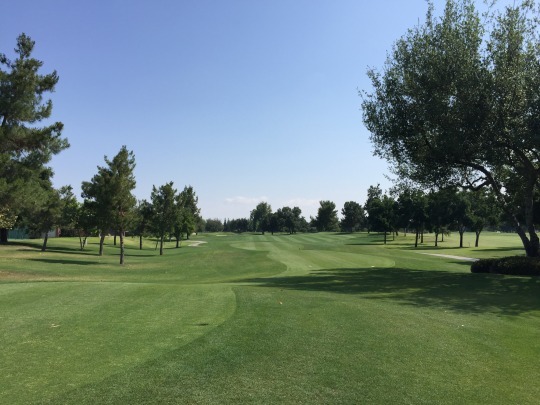 It’s a very nice private members course in a region where “wow” factor on golf courses is in short supply. As mentioned, the conditions were exceptional. 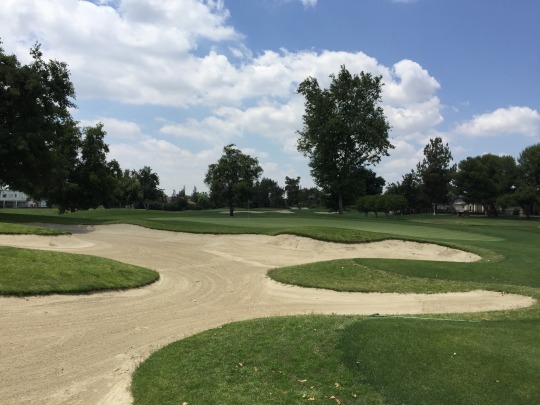 The only knocks were that a few of the bunkers were maybe a tad thin and the greens, though still nice, were not quite as immaculate as the rest of the course. They were still very good, but showed a few more imperfections and rolled a little slower than they looked. All in all, I would recommend anyone take advantage of a chance to play Seven Oaks. It’s a pleasant experience from the moment you pull through the big iron gates. 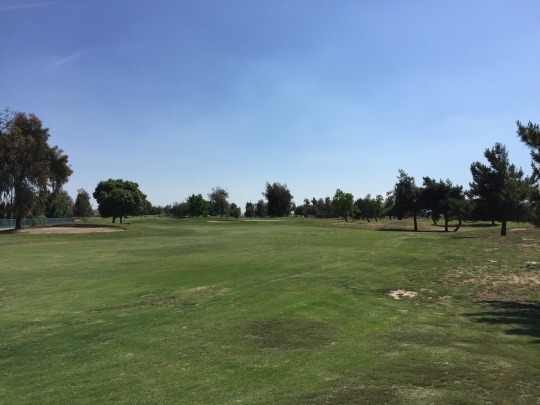 We made the drive up to Lemoore and called the course as we were leaving from Seven Oaks. The guy in the pro shop was a bit wishy washy. He let us know there was a high school tournament going on, but still seemed confident we’d be able to get out around 2:30. We got there and saw a lot of players out on the course, mostly the high school kids in competition. Check in was no problem and we paid a reasonable $28, which included cart. Then, we grabbed a tasty hot dog and a drink before heading out. He had us start on the back nine because of the tournament and it ultimately worked out well. 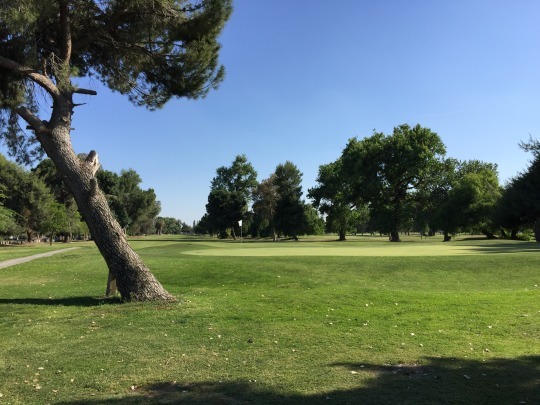 We played as a twosome behind some other groups, and then a single ultimately caught up and joined us from the 8th hole on. Things moved along nicely enough and we finished in just under four hours. 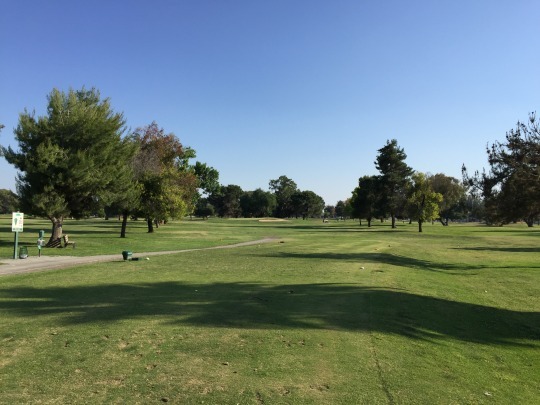 I had fairly low expectations coming into this round considering it’s a pretty obscurely located municipal course. 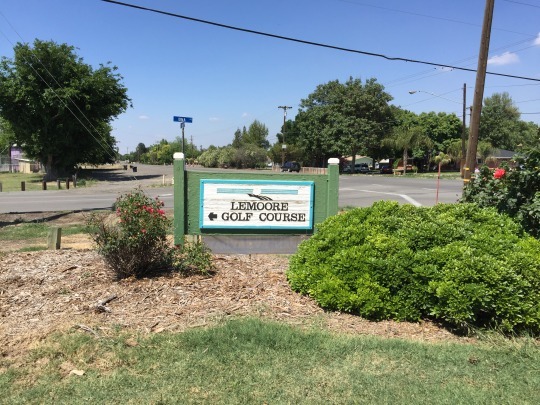 We were pleasantly surprised by Lemoore. It’s nothing that amazing, but it is a solid track and we had plenty of fun there on a beautiful afternoon. The two nines at Lemoore are quite different and I can only assume that they were built at different times. I would guess the back nine is newer, but it is easily the weaker of the two in my opinion. 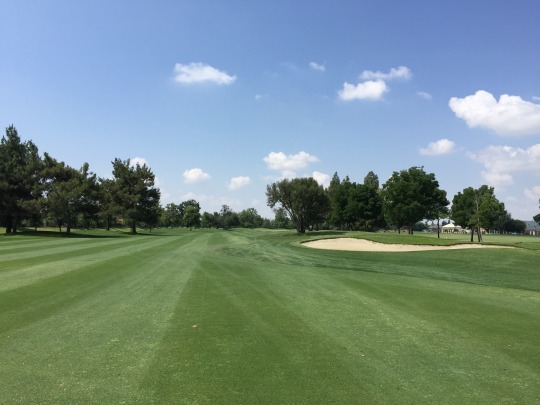 The front nine is more of a traditional Central Valley course (there’s that description again) with lots of different types of mature trees lining the fairways. 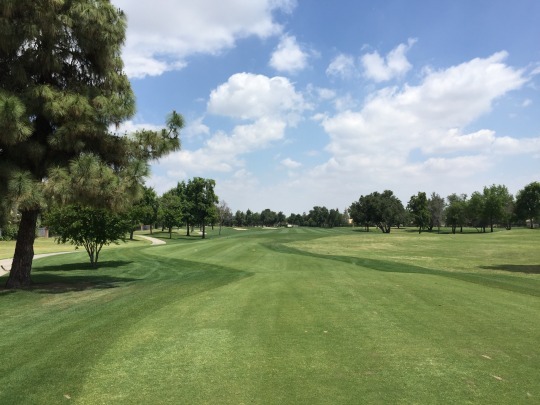 It runs back and forth with a few fun doglegs and a couple funky holes. Then, it also has a handful of very crazy greens that feature big shelves. 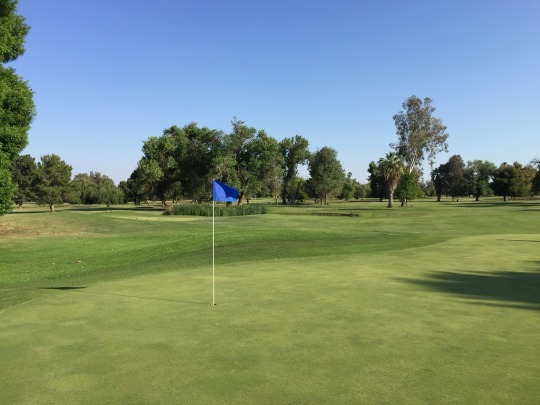 You definitely want to be on the same level as the hole on these particular greens. 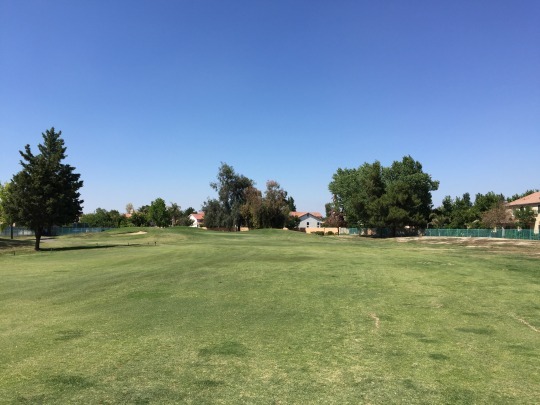 This nine is basically a lesser public version of the nearby Kings Country Club course I had the opportunity to play fairly recently. 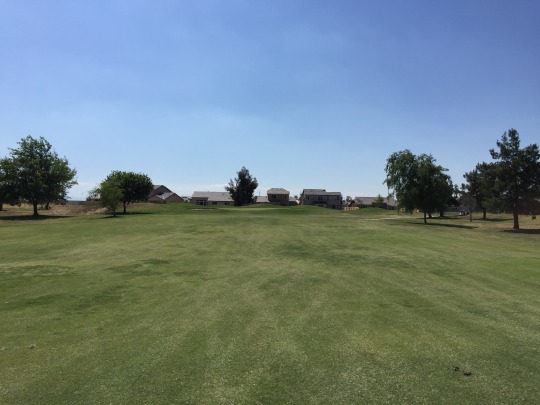 The back nine feels more basic as it winds through a little community. 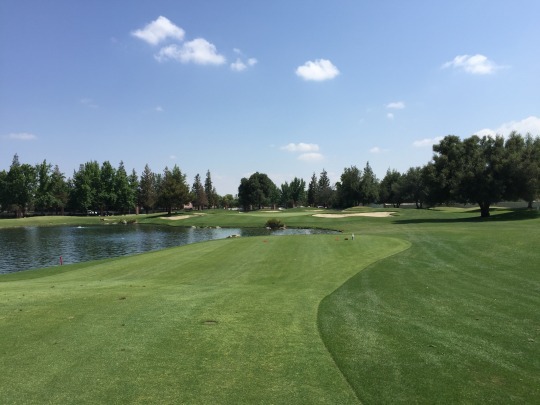 There are a couple of standout holes like the par-3 11th over water and the finishing par-4 18th. Normally, it should play over water, as well. 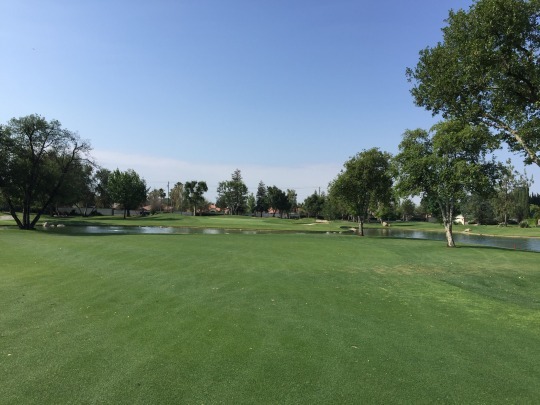 However, all water hazards other than the ones on the 10th and 11th holes were completely drained. They just look like ugly muddy messes now and that definitely contributed to the impression of the back nine feeling inferior. The conditions were pretty decent on this course. Some tee boxes were better than others, but I never had a problem finding a flat spot to put the tee in the ground. 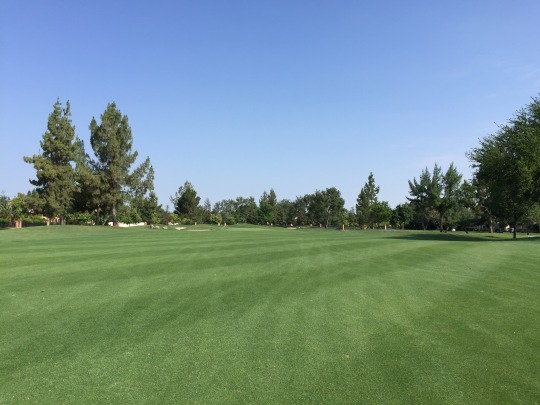 The fairways were generally pretty good with lush, green coverage and a just a few bare spots here and there. I almost always had great lies, though. The rough was much more spotty and sparse with a lot of hardpan areas. The bunkers I found were good enough. 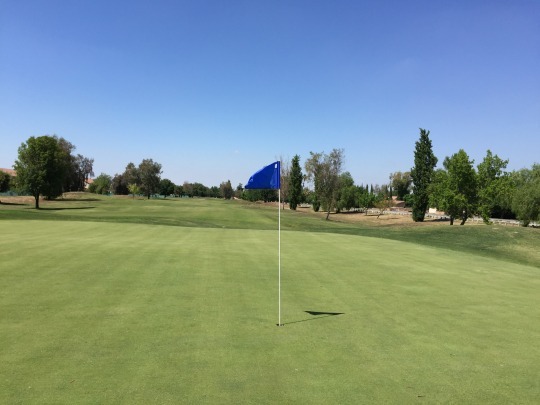 The greens were very firm, but slow and often bumpy on putts. I actually thought the green surfaces were a little worse on the front nine. Otherwise, the front looked and played much better than the back. 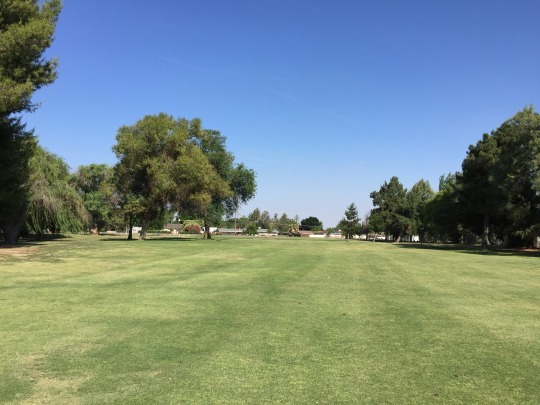 Lemoore Golf Course is definitely not worth going out of your way unless you are a nutty collector like me, but it’s a pretty decent locals’ course. I feel like a broken record because I say something similar for almost every public Central Valley course, but that’s kind of how it is. 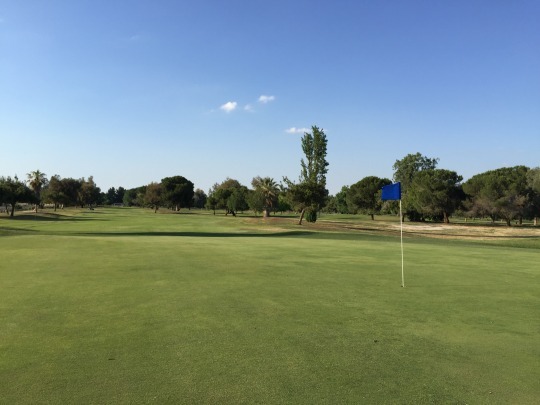 It’s not a golf destination, but while driving through there are plenty of decent courses to enjoy. 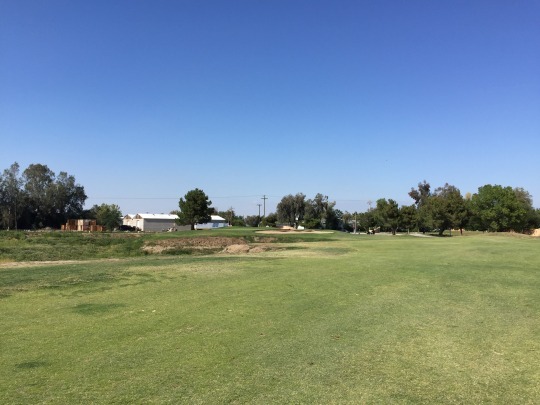 One of the reasons we were willing to trek all the way up to Lemoore is because I figured we could also knock out the other little course in town, Phoenix Sunrise. 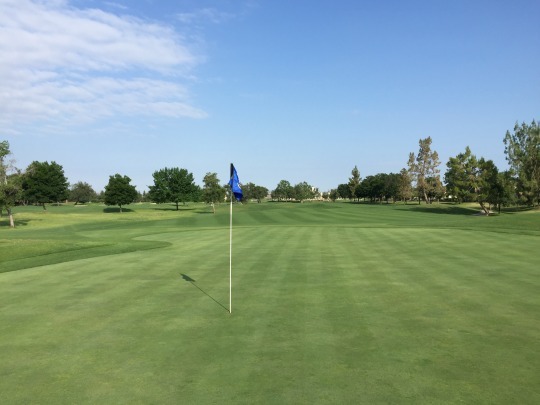 It is literally just down the road from Lemoore GC and is just a 9-hole, par-3 course with very little information available online. However, it exists and I was determined to play it while in town. Unfortunately, we arrived and the gate was all closed up. 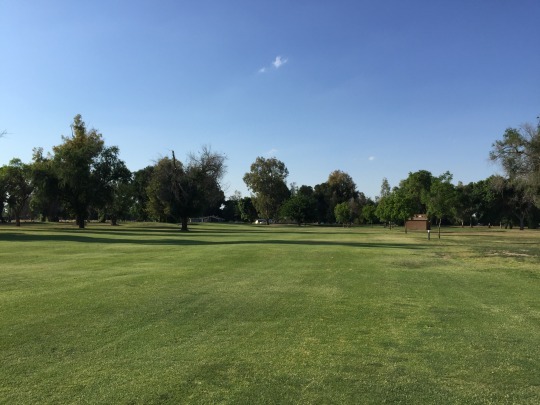 It looked like a ghost town, but the course was clearly still there in some form. I called the phone number I found and got an outdated message. This is a good lesson. I often will call ahead, but with these dumpy little short courses I typically just show up and knock them out as quickly as possible. They usually don’t require much planning or preparation as I just squeeze them in if I have time. 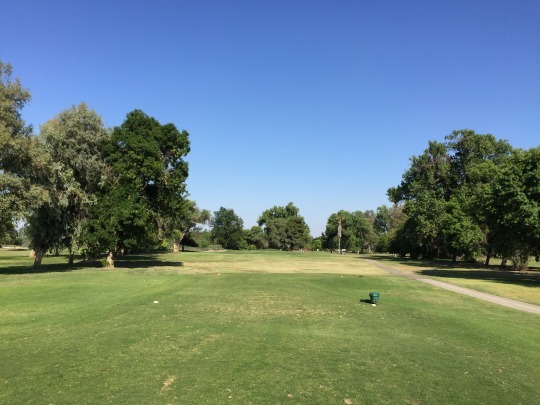 This one really stung, though, because Lemoore is well out of the way from anything else I still need to play and it’s going to be a pain to come back out here just for this crappy little course. And boy, did it look really crappy! Oh well. Note: Later I learned that Phoenix Sunrise had officially closed, so no need to go back there I suppose!